Pre workout supplementation has a number of different benefits that all lead to fantastic results, especially for those who lift and are looking to gain muscle. Pre workout supplements are still a relatively new concept, but anyone who is serious about improving strength and performance should be taking advantage of this, and we’ve rounded up some of the best pre workouts on the market in 2018. Why not also check out the best protein powders to compliment your health and fitness routine? A good pre workout is designed to get you pumped for the gym. It not only improves your strength and endurance but it will help you focus your mind too, in order to really achieve the results you desire. One of the main ingredients to look out for is BCAA, which gives you the fuel you need and also helps with a speedy recovery after a session. 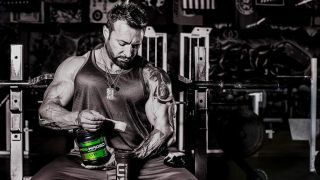 The KAGED MUSCLE PRE-KAGED pre-workout powder dissolves BCAAs rapidly so you can get the most from your supplements. There are many other amino acids to look out for, but all depend on the type of workout you do. Other than that, it’s down to personal preference on flavours, as protein powders aren’t always the nicest thing to drink! Check out our list below for more details on what’s best for your workout. To really gear yourself up before a workout, this easy-mix protein powder is the ultimate pre-workout. It rapidly dissolves BCAAs and is highly absorbable. It also includes 6.5 grams of Pure L-Citrulline which improves blood flow and muscle. Users say the fruit punch flavour is really tasty, making it one of the better tasting pre workouts on the market. It has smaller doses of some ingredients compared to other protein powders, but it is designed to be a well-balanced formula to give you everything you need to make the most of every workout. This pre workout formula is designed to not only give you energy, but to enhance your mood and increase endurance levels, too. It delays fatigue, but is said to have no come down after use. Users say the boost is almost immediate and long-lasting and both flavours taste good compared to a lot of other powders. If you’re training hard, then this could be just the thing you need to give you that extra boost of energy not just in your workout, but in your daily routine too. This pre workout is packed full of the essential amino acids needed to give you the boost you need during a workout, but it is made with all natural ingredients rather than stimulants, which lowers the risk of side effects such as jitters and stomach aches. Users found this pre workout gives you a slow release of energy rather than the immediate effect you may feel with other protein powders and is particularly good for weight lifting. If you find you get exhausted quickly or you’re struggling to up your workout routine while juggling a busy schedule, then you may find that this pre workout gives you both the physical and the mental energy you need to really take your workout to the next level. Both those new to training and more advanced trainers have found this powder to be a good balance of some of the essential amino acids and stimulants, without having any come down effects. If you are looking for something to get you pumped up fast, Cellucor C4 is a fast acting formula that will have you feeling energised in as little as 15-20 minutes. Users who often do cardio early in the mornings have found this pre workout powder to be very effective for them and it still gives you the energy to go about your day afterwards. Some found it a little too strong, but everyone will react differently to different doses, so it’s important to find out what’s right for you. This is also said to be one of the better tasting powders on the market with a popular orange flavour. Whether you’re a rugby player or sampling upping your HIIT training to get the body you desire, this pre workout is designed to give you energy and focus to achieve your fitness goals and smash through them every time. This Optimum Nutrition Gold Standard Pre-Workout includes naturally sourced caffeine which is a great way to wake you up, especially for those morning workouts, although a half dose is recommended for evening workouts. There are lots of different flavours to choose from and it is said to work in as little as 20 minutes. If the thought of drinking a protein powder really doesn’t take your fancy, then consuming a small capsule every day before your workout could be the answer. These fat burner capsules are ideal for anyone looking to encourage weight loss by increasing energy and mental performance during their workout. It contains all the same essential amino acids as other pre workout formulas and they also give you caffeine hit when you need it most. 1-3 capsules is the recommended daily intake if you want to start seeing results during your workouts.